When people find out what I do, they are immediately intrigued by the mysteries surrounding selective college admissions. Usually, the conversation is about how an acceptance letter to an Ivy League college is about as elusive as the giant squid. As college acceptance rates become more selective, and people begin wondering why colleges that accept just 5 percent of their applicants still have an office of admissions instead of an office of denial, we can’t help but to try to make sense of the process. Demystifying the college selection experience is difficult, because there are so many factors at play. This is a strangely nuanced industry, where subjectivity and personal opinion seem to be prominent. In addition, different colleges and universities have different values, which they rely upon as they seek desirable candidates to fill academically and socially diverse freshmen classes. Yet, there are some known factors in admissions. The most authoritative voice on college admissions in the country, the National Association of College Admission Counseling (NACAC), publishes a report titled State of College Admissions that dispels myths and halts rumors. Each factor of admissions is carefully considered as thousands of colleges and universities are surveyed on current trends. Strength and rigor of the college preparatory curriculum. Academic achievement within the context of coursework. Support writing – counselor/faculty letters of recommendation. The good news is that GEMS World Academy Chicago, and its college counseling office, support students in all of these areas in a very personalized way. The academic profile at GEMS sets a foundation for students to be competitive and compelling college applicants. The cornerstone of GEMS World Academy is the IB curriculum. As colleges seek to find candidates who are thinkers, globally minded, broadly knowledgeable, and caring, IB applicants are highly desirable applicants. Only 15 percent of students in the nation enroll in the most academically rigorous curriculum that their high schools offer, and at GEMS, every student is engaged in the same academically challenging coursework. There is little doubt that a low student-teacher ratio benefits student performance. Here at GEMS, exceptional educators and learning specialists establish close relationships with students and make sure that instruction matches students’ varied interests and ability levels. Our assessment and family conference systems rely heavily on student involvement; our students know how to set goals, evaluate their performance and react to setbacks — skills that are vital to success at the university level and beyond. Another part of student achievement is performance on standard college readiness exams. Beginning in ninth grade, every GEMS student takes the College Board’s PSAT NMSQT exam. This exam highlights a student’s testing strengths and helps to identify areas for growth. With a careful evaluation by the college counselor, and a team of expert test prep professionals, our students will understand how to best prepare for standardized testing. According to NACAC, the average counselor in Illinois was responsible for 664 students in 2015. Imagine trying to create an individualized college counseling program with such a case load. What I love about my job at GEMS is how well I get to know the students. I spend time talking with students and families regularly, conduct college programming and create opportunities where I learn about the future goals and aspirations of each student. This all results in me being able to provide the kind of clear, personal letter of recommendation sought by college admissions offices. The letter of recommendation I write about a GEMS student speaks confidently about that student in the context of our school environment. Letters of recommendation from GEMS faculty also are effective and meaningful portrayals of a student’s learning style, achievement and potential. GEMS administrators understand that a robust extracurricular program is key to a student becoming an engaged and lifelong learner. Our students participate in competitive sports during both the fall and spring seasons. They act in a play. They explore robotics or dance or world languages or art. As the college counselor here, I encourage students to take advantage of the extracurricular opportunities available to them, explaining how such choices can help them not only with college admissions, but also with general life success. Helping young people find that perfect college fit is an incredibly rewarding occupation. I love that I get to help students consider the importance of their experiences, extracurricular activities, summer opportunities and lessons learned. 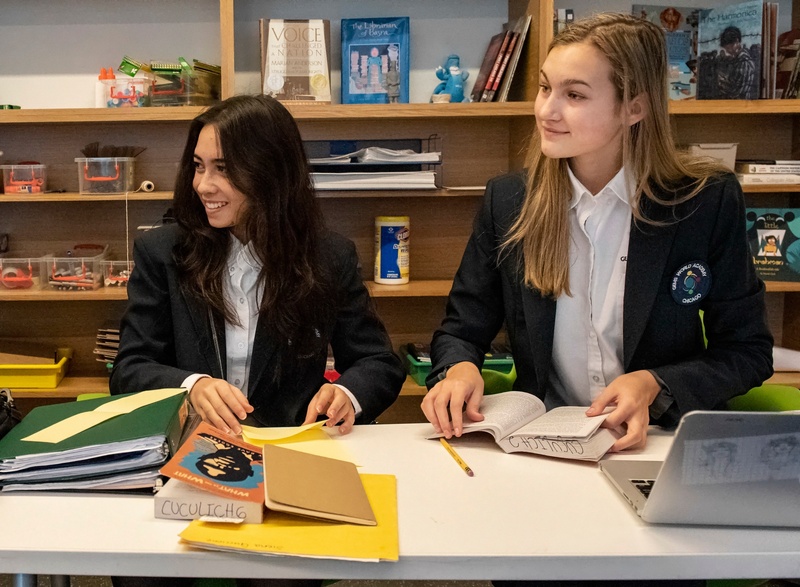 Around the table with admission representatives and their parents, we articulate the significance of the students’ high school years as it relates to finding a college match, preparing for a career and meeting their goals. Throughout my career, students’ own voices and stories have been paramount. I remember one student who told me, after some guided exercises, that she wanted to find a small, all-women’s college where she could study engineering. In addition, she was an accomplished equestrian and wanted to continue riding in college with her own horse, which would need to be boarded nearby. It was a great opportunity for me to find schools that would connect deeply with her and have a major positive impact on her life. I’m thrilled now to be doing that kind of work here at GEMS, a school that is preparing the global leaders of tomorrow. 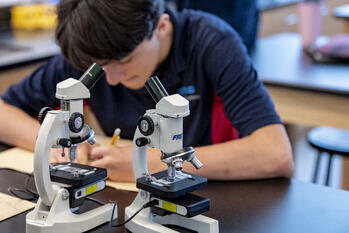 GEMS World Academy Chicago is an independent private school serving students in preschool through grade 12. Our new Upper School building opens this fall.